Instructors in undergraduate science classes often teach skills and techniques by creating exercises that ask rather specific questions. Numerous authors have pointed to the need to help students develop quantitative skills using inquiry-based learning in the classroom. Here I present a purposefully broad question to meet this need. If ice sheets on Antarctica and Greenland were to melt, how much would sea level rise? A broad question leads to a simple mathematical solution. From ice sheet area and average thickness, densities of water and ice, and the radius of the earth, students arrive at an estimate of 73 meters for global sea level rise. Geographic information systems can be used to illustrate ramifications of sea level rise; hypothetical impacts include inundated landmasses, displaced populations, and loss of valuable agricultural land. Duncan Hawley Department of Education, University of Wales Swansea, Hendrefoelan, Swansea, SA2 7NB, Wales, U.K.
Studies into students' understanding about rocks indicate most young students do not have a scientific understanding about rocks. This persists into adulthood. Students' first encounters with rocks are frequently conducted through descriptive observational studies. This approach is inductive and can create difficulties in leading students to compartmentalise rocks and see each rock as a singular entity. This fails to help students recognise and derive generalisations about the fundamental characteristics common to different generic rock groups. Researchers have suggested that input about techniques and conceptual frameworks which geologists use may prove more successful in developing students' understanding, providing they are intellectually safe and accessible. A new pedagogic approach which matches these requirements has been used to create a sequence of investigative activities enabling students to speculate, hypothesise, observe, test, reason and infer about the characteristics of rocks. The approach is framed by two questions (i) What are the key characteristics of different rock groups?, (ii) How did the rocks acquire these different characteristics? Using the knowledge and understanding acquired, students have demonstrated they can assign rocks into appropriate generic groups using the same criteria as Earth scientists. They can relate the textural characteristics to a range of rock properties. In 1999 Shippensburg University established the Burd Run Interdisciplinary Watershed Research Laboratory. The Laboratory uses a local watershed to provide intensive undergraduate field training in the collection and analysis of environmental data, which are then compiled into a comprehensive statistical and spatial watershed database. Geographic information systems serve as the project's organizational focus, providing a powerful tool for data display, analysis and sharing. We emphasize a systems approach that links disciplinary perspectives across courses in geology, geography, biology, and teacher education. Important linkages among watershed characteristics, water quality, and aquatic ecology are emphasized over several semesters, allowing students to build and integrate scientific skills throughout their education using the watershed as a common case study. The Burd Run Interdisciplinary Watershed Research Laboratory provides an easily adaptable conceptual model for improving environmental science education at teaching-oriented institutions nationwide. Its success is largely attributable to three factory: (1) the project is student-centered and goal specific; (2) the selected watershed is accessible, diverse, and at a manageable scale; and (3) the 17-member Laboratory Advisory Board provides for continuous revision, adaptation, and improvement. The Black Hills of South Dakota exhibits many fine examples of stream piracy that are very suitable for teaching geomorphology lab exercises. This lab goes beyond standard topographic map interpretation by using geologic maps, well logs, gravel provenance and other types of data to teach students about stream piracy. Using a step-by-step method in which the lab exercises ramp up in difficulty, students hone their skills in deductive reasoning and data assimilation. The first exercises deal with the identification of stream piracy at a variety of spatial scales and the lab culminates with an exercise on landscape evolution and drainage rearrangement. Carbonate equilibria is a fundamental concept within the geosciences. An understanding of carbonate equilibria is necessary for geologic studies of weathering, surface and ground water chemistry, and global climate. Equilibria and acid-base relationships are difficult to understand without hands-on examples. Alkalinity titrations, in combination with theoretical calculations, offer a simple and inexpensive method to experiment with carbonate equilibria using both known standards and surface water samples. The acquired data provide a link between theory and application in geochemistry. Building stones provide conveniently located and accessible "urban outcrops." As such, building stones may be used for semester-long student research projects in upper-level geology courses. I present students in my Earth Materials class with a scenario: A building owner in downtown St. Petersburg hires you as a geologic consultant. The owner is considering replacing the stone currently adorning the building. Write a persuasive essay discussing the identity, geologic history, and suitability of the building stone in its current use. Compare and contrast the current building stone with several other building stones that might be used for the job. To gather data for their consulting reports, students use a combination of standard field tests and petrographic techniques to identify the building stones and determine possible geologic histories. The students lead a walking tour during the semester to report on their progress and ask for ideas from their classmates. The project culminates in both oral and written reports aimed at convincing their "clients" to buy the most appropriate building stones. As part of this paper, a student who completed the project in the fall of 2000 provides a brief overview of his research and a positive assessment of his overall experience. Perhaps the most urgent responsibility of volcanologists today is the management of volcanic risses. This complex process, however, is one of the most difficult to convey to students in a classroom setting. We have designed a multi-week, cooperative learning activity for our introductory, undergraduate volcanology class, which culminates in the simulation of a volcanic monitoring crisis. We provide teams of students with regularly updated information about a volcano's increasing activity. The data are drawn from existing archives and consist of seismic, gas composition, deformation, and surficial variations, as well as eyewitness reports. Students must respond in real time to the volcano's changing conditions in a highly interactive, dynamic, and energetic experience. The exercise incorporates the development of skills including interpretation of volcanic data, design of hazard maps and alert-level schemes, analysis of rapidly changing databases, consideration of the human costs of scientific decisions, and management of multiple simultaneous tasks. We believe this activity creates an effective and exciting learning environment in which students have the opportunity to apply theoretical concepts to a more realistic situation than is achieved in conventional classroom exercises. In so doing, we hope to develop students' critical thinking skills as well as to convey the challenges faced by volcanologists in hazards mitigation. A site at Helgustadir, East Iceland, supplied large quantities of transparent cleavage rhombs of calcite (commonly called Iceland spar) from 1668 to 1925. These crystals played a significant role in the early development of several fields in the physical sciences including wave optics, crystallography and crystal physics. From the mid-19th century onwards, most of the Nicol prisms which were used in petrographic microscopes, polarimeters and various other optical instruments were made of Iceland spar from the Helgustadir locality. These instruments contributed to advances in mineralogy and petrology, as well as in branches of physics, chemistry, biological sciences, and technology where polarized light was employed. This article illustrates applications of Geographic Information System (GIS) technology to two alternative contouring methods published in English 1932 and 1950 by the Japanese cartographer Kitiro Tanaka. Both of these methods have the potential to help students better understand and visualize contours. Inclined contour traces are defined by the intersection of topography with a series of evenly spaced, inclined planes, as opposed to the traditional horizontal planes used for most contours. This method has the potential to help students understand the concept of contour lines and profiles, aid students in the visualization of topography, and introduce students to the cartographic concept of analytical hillshading. Illuminated contours use black and white contours of varying thickness on a gray background to give the impression of an obliquely lit 3-dimensional surface. This method could help students visualize topography and introduce students to the concepts of aspect, slope and analytical hillshading. The many unanswered questions about the forces behind natural hazards (and the consequent difficulty involved in their prediction) provides an excellent source for inquiry-based learning at elementary and secondary levels. The abundant information and frequent occurrence of natural disasters and the straightforward integration of other subject areas such as social sciences, mathematics, and language arts make the study of natural disasters an exceptional topic to support students' efforts to learn key earth science concepts in a way that is intellectually challenging and personally meaningful. 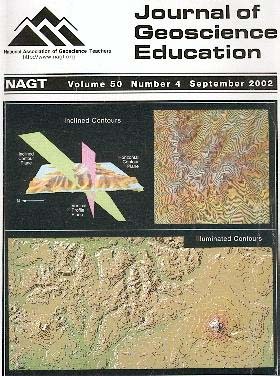 To promote this approach to education, the authors offered a week-long "Mapping Natural Disasters" workshop to 30 K-12 teachers during the summer of 2001. The workshop modeled the effective integration of hands-on activities, internet-based data, and use of geographic information system (GIS) software, a powerful analytic tool that displays the spatial distribution of data. Through these three approaches, teachers deepened their understanding of current earth science concepts through models and simulations, and then applied this understanding as they analyzed data downloaded from the internet and mapped with the GIS software. In addition, the workshop modeled techniques for promoting student inquiry and reflective professional practice among teachers that the authors hope will carry over into other curriculum units. An exercise in a course on signal processing techniques for students was the motivation to report some of the procedures on signal recovery capability so that other students can, perhaps, use them as an introduction to data analysis. This paper illustrates some of the procedures that can be used easily in order to extract "signal" and "noise" from a set of data. The rather unconventional dataset of the publication record with time of one of the authors has been used, and under specific assumptions for the set of data, smoothing routines were applied using 5, 7, 9, and 11-point running average smoothers. For the original and the smoothed data, the power spectra were calculated. Significant peaks at certain periods are observed irrespective of the smoothing procedure and presumably record historical event periods of some importance. In this example, the Blackman-Tukey theorem is employed regarding signal and noise resolution. The estimates of signal and noise power were integrated over the total frequency range to obtain a statistically stable estimate of the "signal", indicating that about 85% of the data are robust to variations in the processing techniques used.